Invoice financing can be broken down in many ways, one is into selective invoice financing and whole turnover. Selective means that you choose which invoices you want funded, and whole turnover means that all of them are automatically considered for funding. This infographic show the results from our research to establish the market demand for each approach. As you cans see almost two thirds wanted whole turnover, whilst just over a third wanted a selective approach. Whilst there is a market for both, the whole turnover option is desired by the majority. This is interesting as recent moves by one of the large selective providers, MarketInvoice, was to expand into the whole turnover segment of the market. A logical move, when you consider our findings - they can expect the market for funding against all invoices to appeal to almost twice the market that they have for their existing product. To get a quote please request a call back or ring Sean on: 03330 113622. 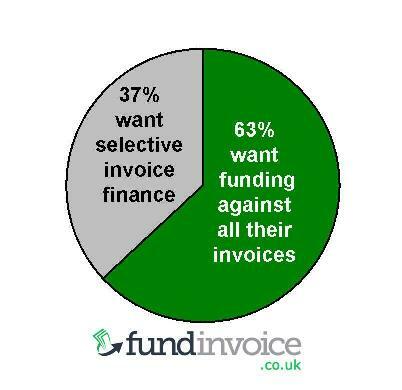 <a href="https://www.fundinvoice.co.uk/blog/invoice-finance/post/selective-invoice-financing-whole-turnover.html" ><img src="https://www.fundinvoice.co.uk/images/selective-invoice-financing-whole-turnover.jpg" alt="Selective Invoice Financing Versus Whole Turnover" width="400" /></a><br /><a href="https://www.fundinvoice.co.uk/blog/invoice-finance/post/selective-invoice-financing-whole-turnover.html" >Selective Invoice Financing Research</a> by <a href="https://www.fundinvoice.co.uk/" >FundInvoice</a>.